1.Stoker Stoker is a type of coal firing in boiler. A stoker is also a device consisting of a feed and a grate and is used for feeding coal (or other solid fuel) into a furnace, distributing it over a grate, admitting air to the coal for combustion and providing a means for discharge of ash. If too low, fines can be blown away from the bed without burning. Minimum ash content required so grate will be protected from reflected heat. If too high can be blown from bed. Ash melts and clinkers if too low. High swelling coals give uneven combustion. 2.Pulverised coal (known as pf, pulverised fuel) firing is combustion of powdered coal suspended as a cloud of small particles in the combustion air. It avoids the need for a supporting grate and therefore eliminates restrictions on equipment size, and the reason for its wide scale adaptation is its suitability in very large boilers. Substantially more heat is released per unit volume than in stoker firing. Because the coal is carried by the combustion air, residence times are much shorter than for stokers; just a few seconds. Despite the short residence time, good burnout can be achieved as long as the coal is sufficiently finely divided. Reduces net calorific value. Creates handling problems if too high. Limits higher for lignites and low rank coals. Reduces calorific value. Generally should be low. For down fired pf burners. With suitable equipment almost any calorific value fuel can be utilised. Can be higher if blending or FGD is employed. Overall is dependent on local emission regulations. Various limits apply in a few countries only because of nox emissions. Figure normally for inland coals. In general export coals well below 0.05%. Lower HGI values require larger grinding capacity and more energy. Dependent on capacity of grinding equipment. High fines content can increase moisture content and create handling problems. Dry bottom boiler - IDT greater than 1200°C. Wet bottom boiler - flow temperature less than 1300°C. 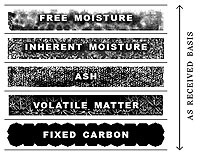 Fly ash That fraction of the ash content of a coal, no matter what the combustion process, which escapes, entrained in flue gas, from the combustion chamber.